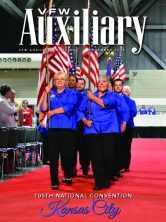 VFW Auxiliary Magazine is published six times per year. 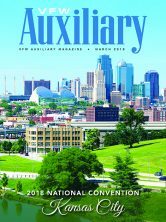 Each member receives a copy and issues are available digitally by clicking on an image below. 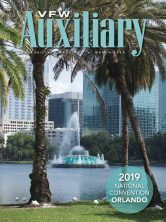 Read about what Auxiliaries are doing to make a difference in their communities, the latest information on national programs, newest member benefits and much more! 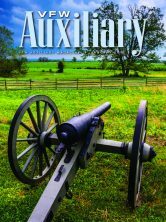 The editors at VFW Auxiliary Magazine are always working to develop interesting stories and are delighted to receive your information and photographs. As with other media outlets, stories that are unique, new or of special interest to Auxiliary members will take precedence over more routine contributed content. Instead, send information about various activities for our national programs that shows your Auxiliary members making a difference in the lives of veterans and those in your community. 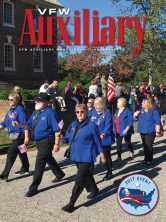 Did your Auxiliary participate in a StandDown? 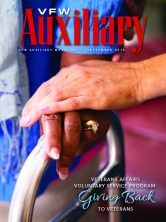 Did your Auxiliary work to raise awareness about veteran and military suicide prevention? Did your Auxiliary participate in Make a Difference Day? Did your Auxiliary adopt a Veterans Park or contribute to a Veterans Memorial? 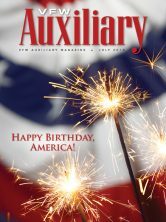 Did your Auxiliary educate youth about patriotism? Was there a particular Auxiliary event that was very unique and/or successful? Note: There is a delay between receipt of information and its publication. 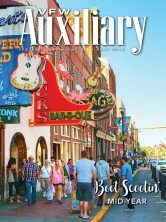 Magazine issues are written two months in advance of the publication date and printed one month in advance. For instance, the January issue is actually sent to the press in late November. All copy should be typed. If emailed, copy should be attached as a Word (.doc) document. Include the Auxiliary number, city and state of persons pictured. Spell names correctly and include titles of persons pictured. Identify members by first and last names. Send photos in jpeg format, 1 MB or larger. From computer – “Save as” largest file possible and then email the photo. If it’s a print – Take a picture of it with your smart phone and then email from your phone choosing largest file size. If scanning – Choose largest file (minimum 300 dpi) and then email the photo. Mail copy of your photo to National Headquarters so we can scan it in and return it to you. When mailing, place photo(s) between cardboard and do not type or write on the front or back of the picture. Identify each person (no more than five per photo) on a separate sheet of paper. Send a self-addressed stamped envelope if you want us to return your photo.